There has never been a better way to show your commitment than with a promise ring. Promise Rings are not anything new. There were “posy rings” presented between lovers as early as the 1700s. A promise ring can represent anything from a loyal friendship to a renewal of vows within a marriage. They are not just for people that are “afraid to commit.” The problem is that no one really knows where to start with a promise ring. Bring up the topic of a promise ring. In your relationship, it probably makes sense. Sometimes, a partner might have a misconception about what the ring represents. Whether you are using the promise ring as a pre-engagement commitment or a renewal of romance within your relationship, you must first make sure that this is something that belongs in your relationship. If your partner has an objection, this is a great time to have a conversation. You could also offer to get matching promise rings to show your own commitment to her. For a matching set, it might be best to get a white gold channel set band so that it suits both partners. The best promise ring for her is the one that she will wear. Chances are, your significant other will tell you flat out what she wants. Silver is always a great place to start, especially because the cost will be much better. If you are going with silver, be sure that you don’t skimp on the stone. Consider giving her a larger diamond in the center and a few accent diamonds to offset the center diamond. It’s got more bling but can often have a smaller price tag while still bringing the sizzle. This is a great way to add some symbolism, too. 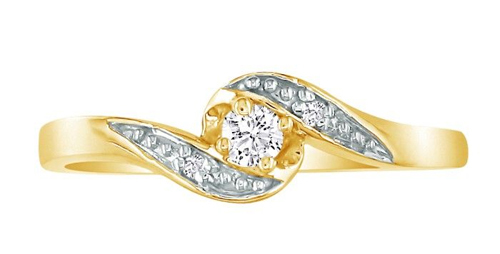 Consider an Intertwined Hearts Promise Ring or even Overlapping waves to mimic the eternity symbol to really underline your commitment. 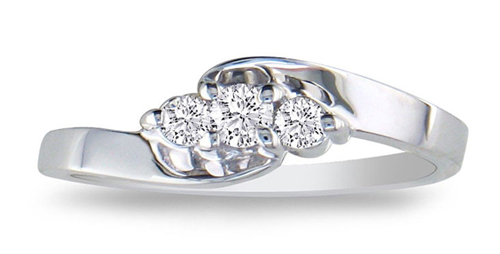 Look no further than SuperJeweler for your promise rings. We have a promise ring for every girl and every budget. Use the filter features to determine the metal and setting that you’d like. We have a great selection and you’re sure to find something that will make her heart melt. PreviousPrevious post:The Three Diamond Ring – What Does It Represent?NextNext post:Spoil Your Valentine for Less with SuperJeweler! Each ring is just a ring until a special feeling is attached to it and gives a beautiful meaning to the ring. Its a complete guide to buying promise rings, I must say. Amazing! As the name of this rings itself to explain what it is actually. Promise rings are a symbol of promises we made and we should keep our promises. Usually, the promise ring is small in size even diamond or gemstone of this ring is also small and simple and also not that much expensive like an engagement ring. The promise ring is more about commitment or promise. Engagement rings are specifically for the engagement ceremony. The promise ring is not for any specific reason it is different for all couples for which promise they exchange ring or they gave ring, they only know, it’s their secrets. But mostly it is for the commitment of new relation.Ornate jewels have a wide range of varieties and collections for your near and dear one.